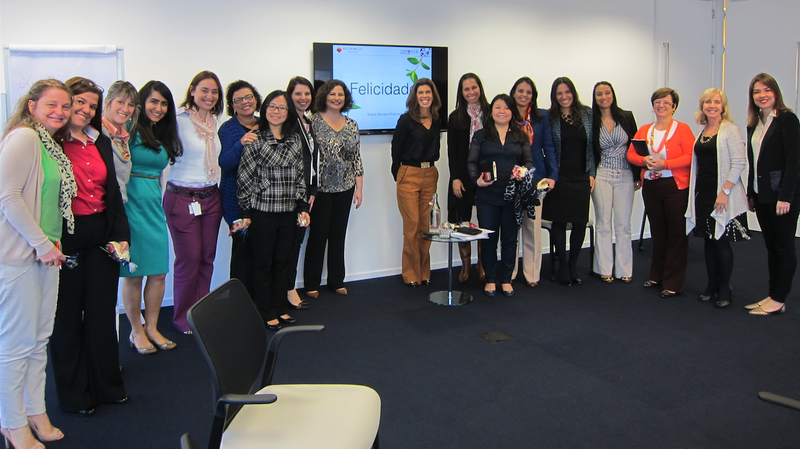 Last week Maria facilitated a great discussion on happiness in São Paulo with a number of women executives from a major multinational organisation. This was really well received, and I thought I would share her slides with you. Because the slides are mainly graphical in nature, I thought I would just take you through them briefly. They start with some simple guidelines that Maria and I developed some time ago to help people reflect on just what a good dialogue really is. These guidelines belong together with our Ladder of Seeing, which was designed to help people understand just how powerful a dialogue can be when it not considered as a combat sport. 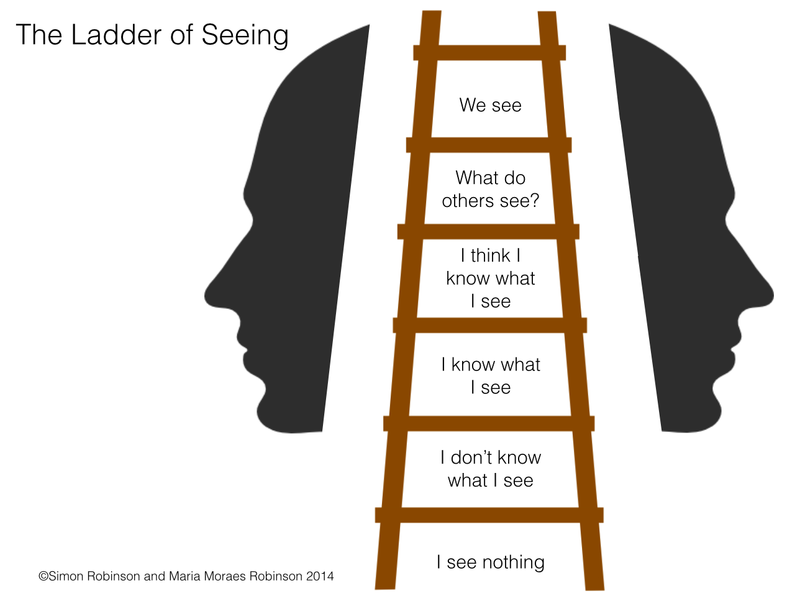 Note that the very top of the ladder is blank. It is for you to decide what is there, not us. Maria starts with a look back in time in relation to the different philosophies of happiness, starting with Buddhism, moving into what was the original philosophy in Christianity, and then moving through the middle ages and industrial revolution in the UK. These pictures are coupled with the deep happiness walk in which key philosophers and their central insights are highlighted. 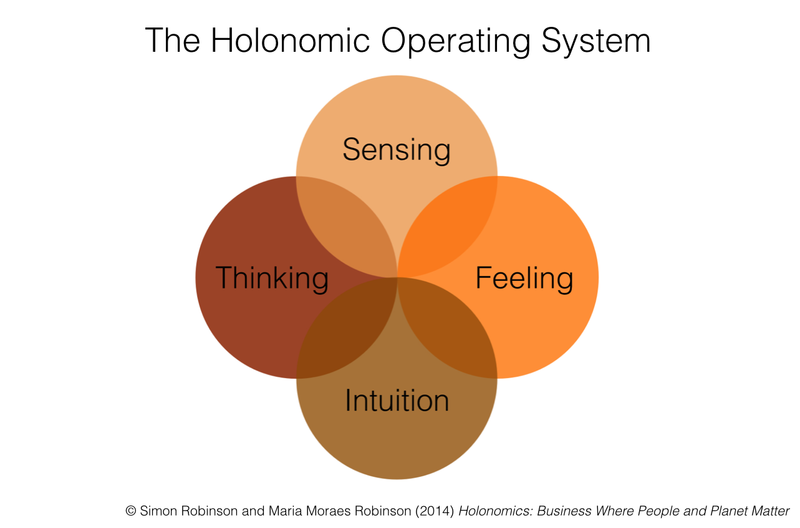 Dialogue can also be seen in relation to the holonomic operating system and the four different ways of knowing – thinking – feeling – sensing and intuition. When people speak from one particular dimension and are not mindful enough to realise that there are other ways of knowing reality, then a dialogue will not be fully authentic and will quite possibly break down. It is remarkable how many people self-report that their bosses and managers have no ability to truly listen to them, and this is resulting in a great deal of unhappiness at work. Indeed, when Maria asked people about what their conceptions of happiness were, and could it be measured, many said that unhappiness can be measured but not happiness. Maria asked the group to reflect on this, and the insights which came were that in fact, yes, happiness could be measured, it is just that when you live in a society which is continually emphasising and reinforcing unhappiness, this fills our thoughts in ways in which we are not always consciousness. Such is the power of an authentic dialogue to help people discover these deep insights for themselves. 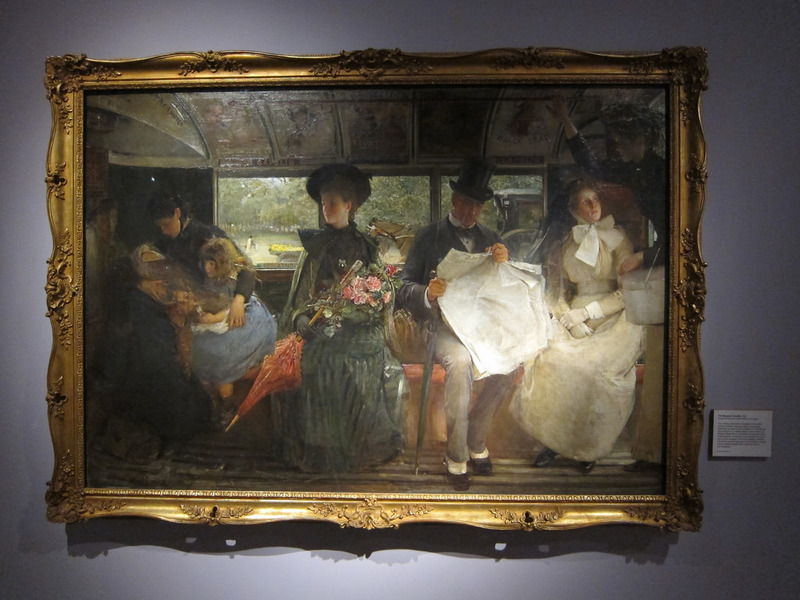 One of the pictures in the deck is of this painting, The Bayswater Omnibus by George William Joy (1895). We had the opportunity to see it at the Sherlock Holmes exhibition in London this January. Its it amazing what can happen when the energy and attention of every member of a dialogue group is positively attuned, respectful and inquisitive. In this dialogue, Maria began to explore this painting in ways in which she had not expected, pointing out that in this era, you can see how the women have freedom, they are relaxed, and that the gentleman does not seem to be related to the women who is in a central position in the composition. Of course shopping in this era gave way to commercialism and consumerism the following decade, and it is interesting that Tim Kasser, a psychologist who taught Maria and I on the Schumacher College Economics of Happiness course, points out that people who have materialistic attitudes experience less happiness and more distress in their lives, and additionally exhibit antisocial and non-sustainable behaviours. The final part of the dialogue was an exploration of different measures of happiness, and Maria showed this video which is a three-minute introduction to Gross National Happiness if you are not familiar with this concept. There are many different ways of measuring happiness using different techniques and methodologies, so it is definitely worth reading the various reports in depth rather than simply look at the tables which have the final rankings of happiness per country. 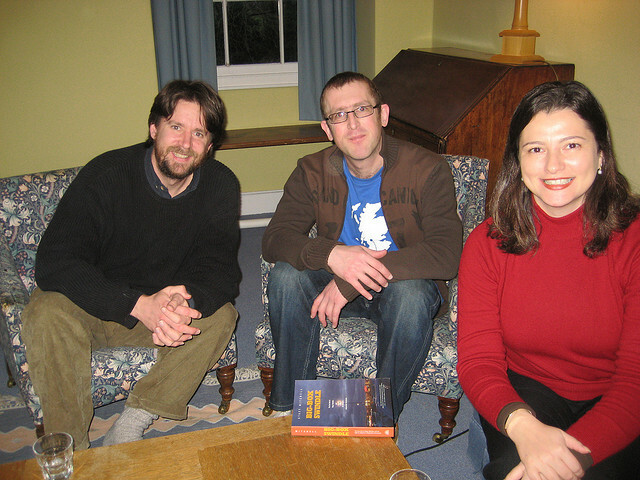 By all accounts it was a very amazing dialogue session, with a huge amount of input from all who were there. The dialogues were organised by our friends at Empower Women Brasil who are doing some fantastic work helping women in Brasil develop personally and professionally, from all parts of Brazilian society. If you ever have the chance to take part in a dialogue with Maria I can strongly recommend it – she is insightful, spiritual and has a huge and wide knowledge of the development and evolution of human consciousness the like of which very few people have, but she also has an amazing way to facilitate deep insights for all those taking part. 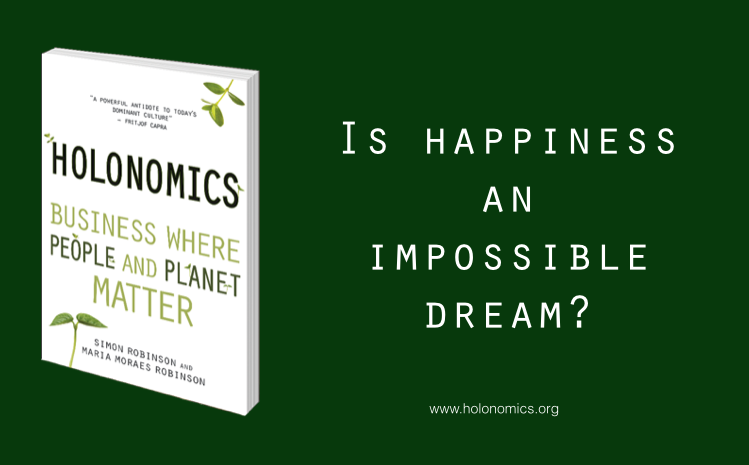 If you would like to find out more, please check out our book Holonomics: Business Where People and Planet Matter. Maria is becoming recognised around the world now for her interest, research and work in happiness, and in our book you will find much more about her philosophy and thoughts.